There are plenty of reasons why Villa Kami is the perfect holiday home. You could come for the ambiance, which is something you’ll find in abundance at the Padonan Village in Canngu. 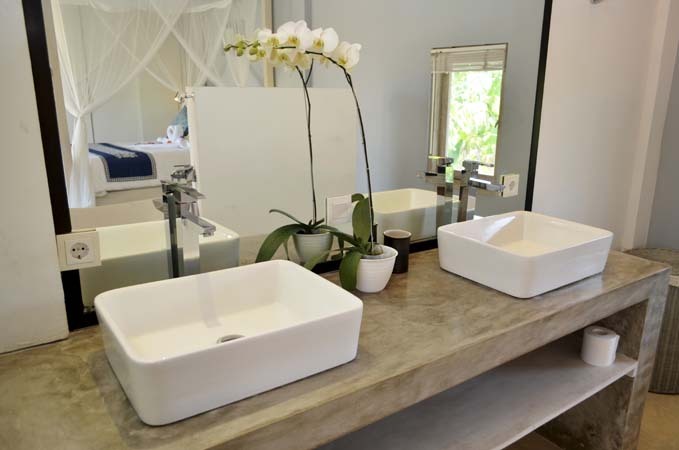 You could come and enjoy the peace and luxury at the beautiful four-bedroomed villa complete with a spacious dining area and an open-concept living space that will make you never want to leave. You could even come for the free membership to Finns Recreational Club, which is offered to up to four of the guests staying at the gorgeous villa. Regardless of your reasons for visiting this quaint Balinese town, we guarantee you that it will be a holiday you’ll never want to forget. 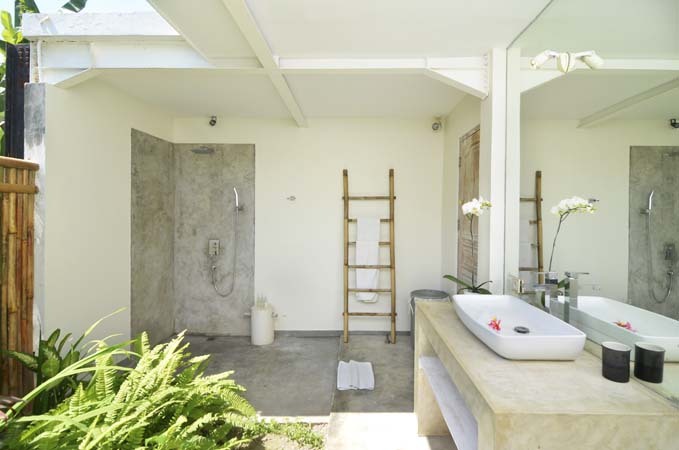 The Villa Kami is surrounded by the scenic beauty that is the rice fields of Canggu. Other than these breathtaking vistas, delicious meals await guests at fine dining establishments such as The Beach House and The Old Man’s, after which you can spend a day at either the Berawa Beach or the Echo Beach to enjoy the sun, the sand, and the surf. 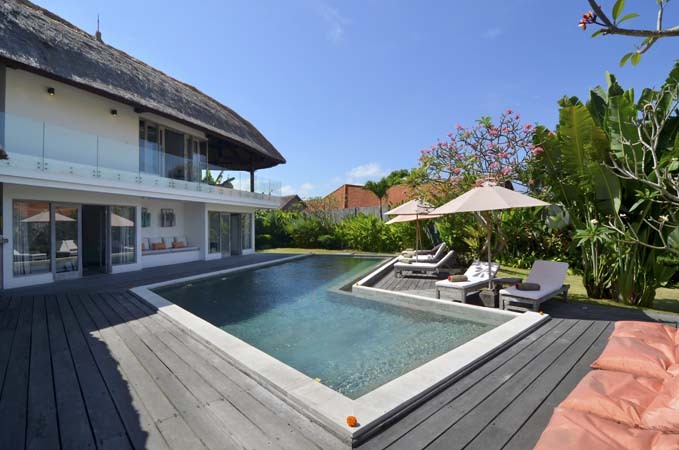 The breathtaking views of the outdoor pool and garden that can be enjoyed from the comforts of the airy living space in this villa are enough to put you in a state of deep relaxation, which is exactly what you need after a stressful spell at work or home. Comfy sofas dot the spacious living room, and quiet ceiling fans give you plenty of cool, refreshing air to breathe while you nap or watch something on the flat-screen TV with a surround-sound system. The dining area is right next to this, its centerpiece being a large dining table with enough traditionally designed dining chairs to seat eight people. Meals here are bound to be memorable, especially since a fully-equipped kitchen complete with a breakfast bar is located on one side of the room where you and your family can share a fun meal in the morning. The highlight of this outdoor living space is a glorious 15-meter pool that’s lined by a timber deck. 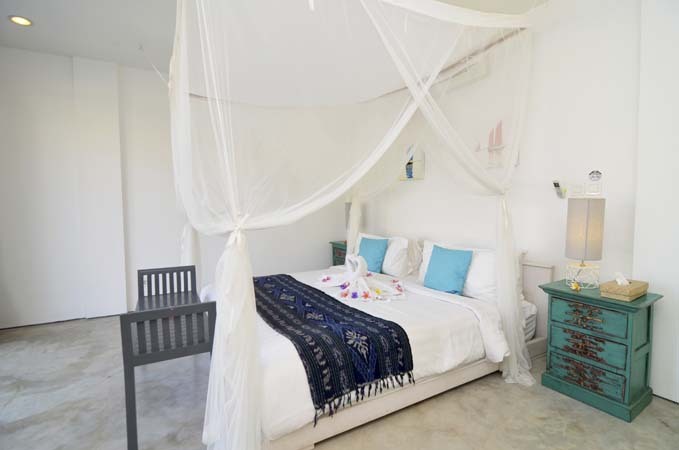 Tropical flora completes the seaside vibe of the Villa Kami, and you will find plenty of places to relax in the form of sun chairs and beanbags lining the deck. To cap it all up, a beautifully-weathered dining table with enough room to seat four sits on the outside, giving you the perfect outdoor dining area for those quick early morning breakfasts or early evening dinners with your loved ones. 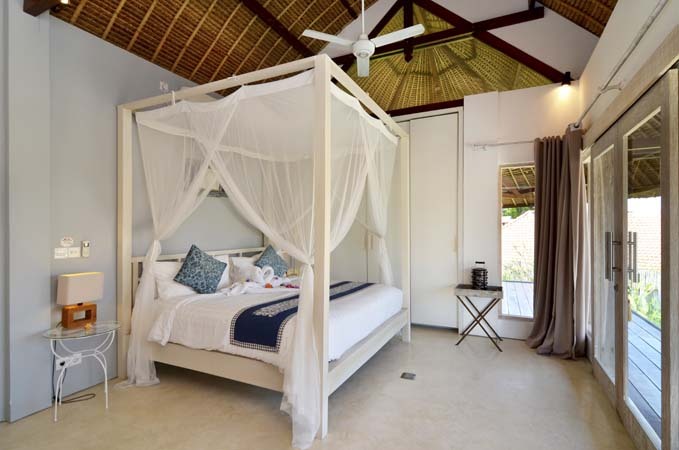 All three bedrooms at the Villa Kami are spacious and furnished with canopied beds that provide a luxurious night’s sleep to the guests. 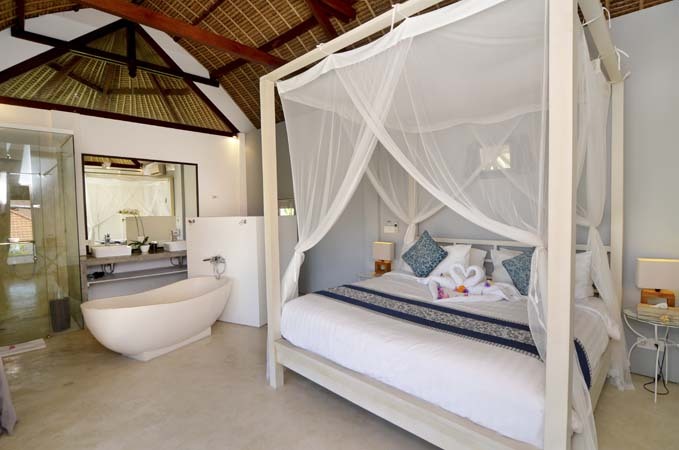 Three of the four bedrooms are in the main villa, while the fourth is in a separate bungalow within the compound. The fourth bedroom features two single beds, making it ideal for kids. 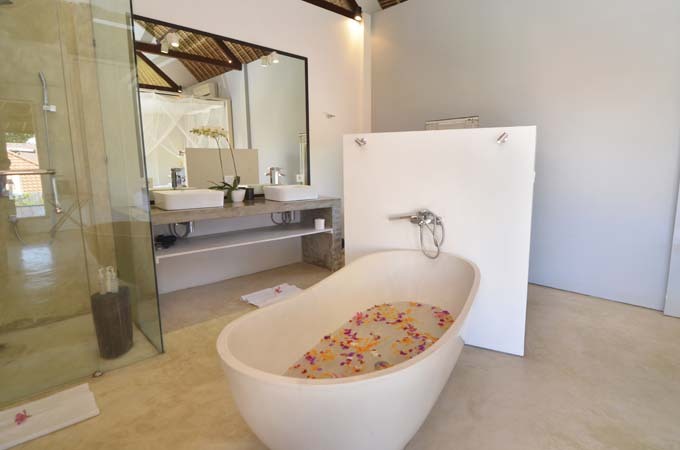 Each bedroom boasts of a semi open-air bathroom with showers, bathtubs, and other luxurious amenities to make your stay here as comfortable as you can imagine. 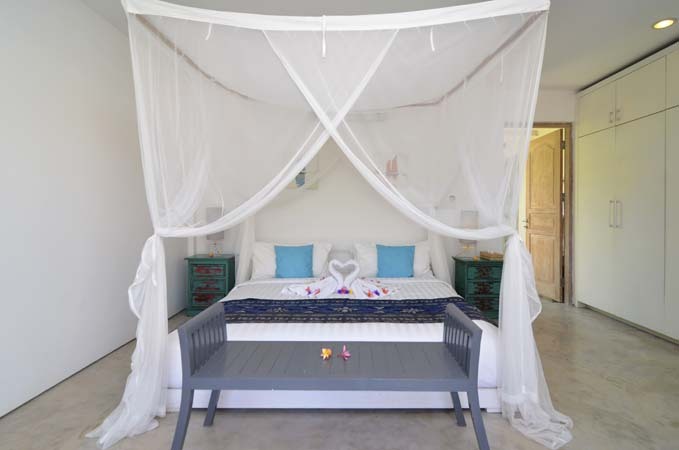 The Villa Kami is overseen by a villa manager and a host of staff that is on-hand at all times to ensure that your environment and your experience remain as magical as possible. 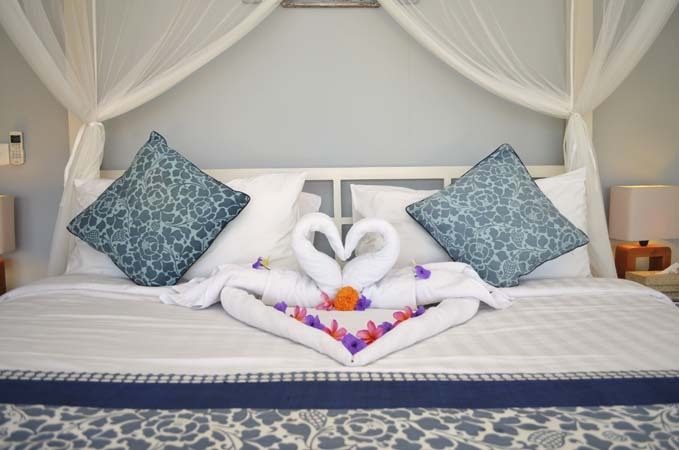 Housekeeping, security, and transport are available, as is a massage service, which can be performed in the villa’s own spa room any time you need it. If you desire to indulge your taste buds in some delectable Balinese delicacies, then all you need to do is to request a private chef at a small extra charge.